The line of Yale Type B through EE time locks pictured, upper row from left to right. The lower row shows A and G.
Front elevation of the Yale Type C with glass bezel. Unlike the screw-down bezel of the Type A this bezel is a bayonet style. Front elevation of the Yale type C with the glass bezel removed. 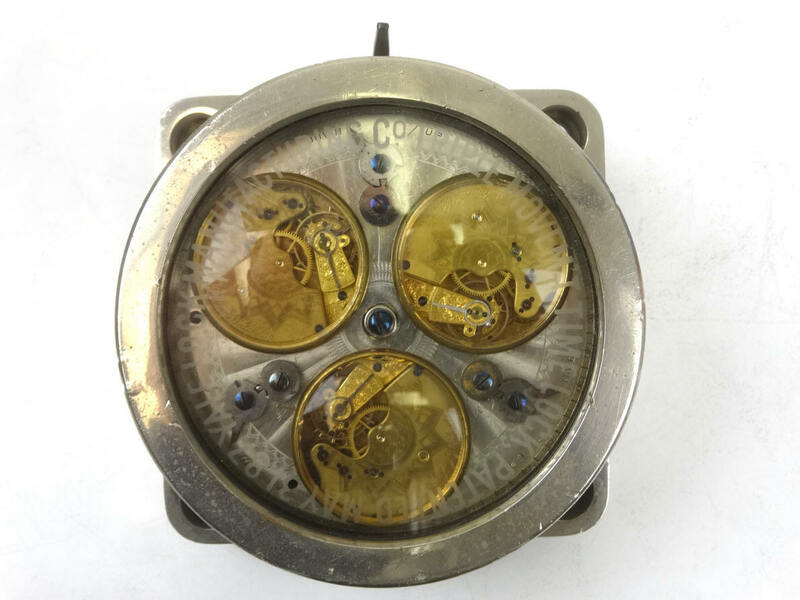 The outer dial ring is engraved into the rotating movement table can just be seen around the perimeter edge. Three quarter elevation with bezel on, left and off, right. The perimeter hand grip knurl is located just below the thin, engraved dial ring round the beveled perimeter of the rotating movement plate. 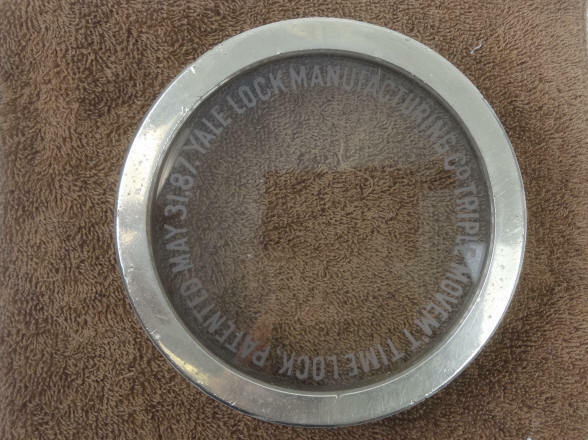 The glass cover shown on a dark background to better reveal the etched glass lettering, "YALE LOCK MANUFACTURING CO. 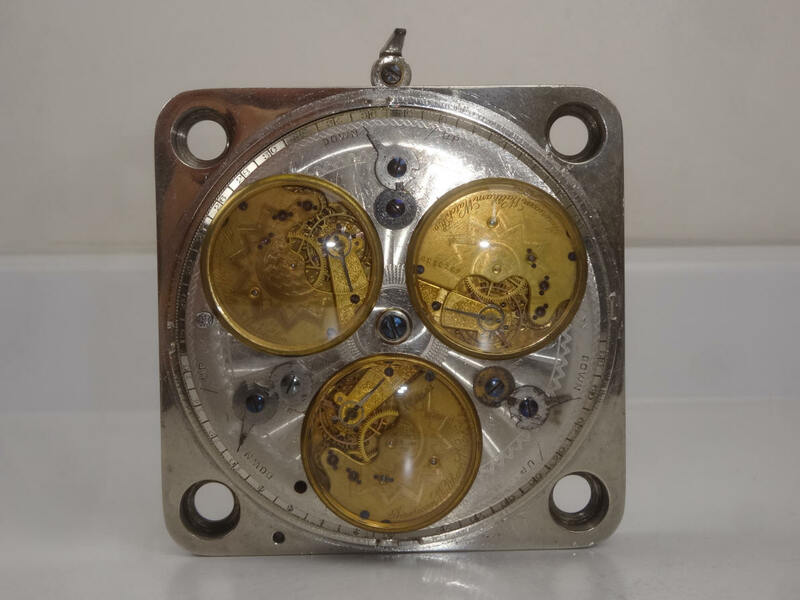 TRIPLE MOVEMENT TIME LOCK, PATENTED MAY 31, 87." 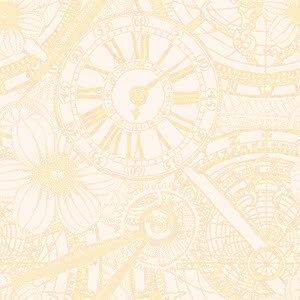 The cover, which is not easily slipped off the base case collar due to the tight machining tolerance and depth of the cylinder, must be fully removed to set the time lock. This risks damage to to the bezel piece from mishandling, mainly being dropped from pulling it off. It is remarkable that the original glass is still intact. 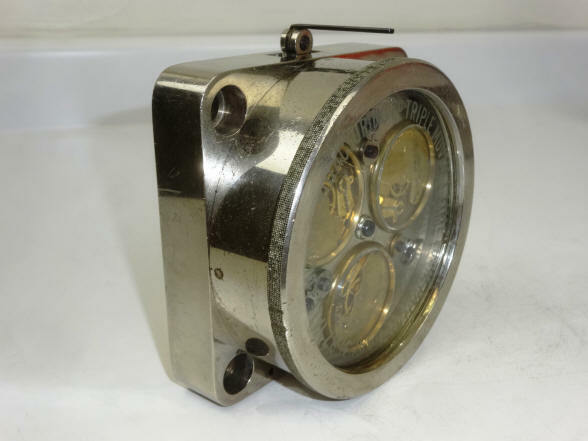 The second photo shows the rear side of the rotating movement plate. 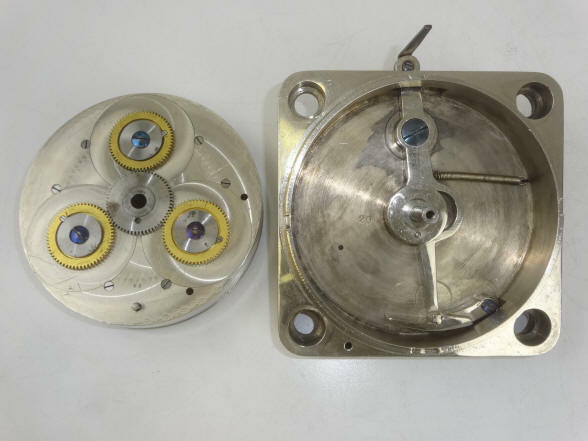 As with the Type B, the center gear which is held stationary to the case through a pin inserted into a hole at the 6 o'clock position of the gear, simultaneously winds the three satellite gears; one for each watch mainspring. 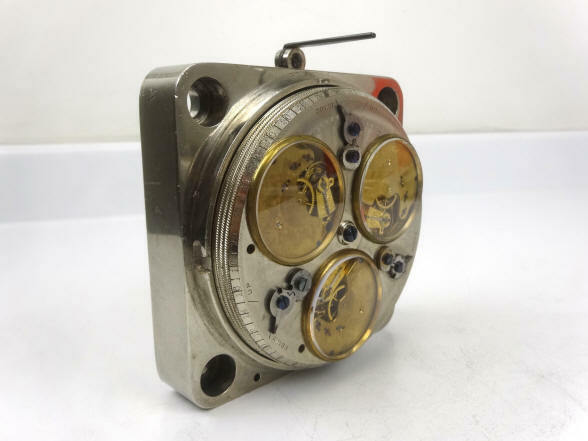 A pin on the surface of the movement plate, near the perimeter, also located at the 6 o'clock position and also at the zero hour dial location engages with the release shown in the lower case. A demonstration of the Yale Type C, 1888 winding and setting demonstration. Next a comparison of the release levers between the Type C and Type E locks.